I’ve written about my hobby (obsession?) with early camera technology for TOKY before, sharing the technique of large-format photography and caffenol development. Along that vein, I wanted to share another project that I’d kicked around for long enough it was time to actually do something about it. I’ve messed around with the idea of a camera obscura in the past, but those attempts were crude, and hastily prepared. I wanted to create something more polished. So, I thought I’d scale it up a bit. 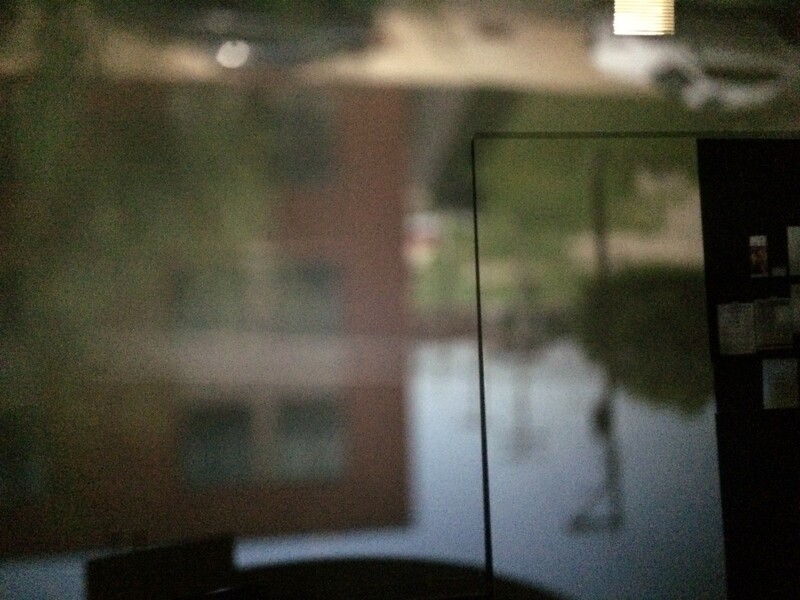 What if I could make a camera obscura that was bright, sharp, and right-side-up? Almost like a giant TV screen projecting what was happening just outside. This would require a fair amount of tinkering and probably a lot of failure. Luckily, I embrace both of those ideas! Today’s cameras are, at their core, a modernized version of a camera obscura. Relying on my knowledge of a camera’s moving parts, I thought I could deconstruct the technology to work my way backward. First, a little history of the camera obscura and our understanding of light itself. Camera obscura is latin for “dark chamber” —- if you have a darkened room, and create a hole for light to pass through, you will get a blurry mirror image of the outside world projected on the wall. At its core, the camera obscura is an analog for the optics of the human eye. But more on that later. This basic construction was the tool for scientific and artistic research for hundreds of years. The earliest concept of a camera obscura originated around 400 to 300 BCE and fascinated the Greek thinkers. It is even rumored that the architect for the Hagia Sophia used a camera obscura in his experimental designs. However, the first clear blueprint for a camera obscura comes from Leonardo da Vinci in 1502 after he studied ancient texts and the human eye extensively and put the pieces together. Chances are, Leonardo used a camera obscura to replicate the intense linear perspective used in many of his works, notably his Last Supper. Other artists are theorized to have used this approach for rational proportion, namely Johannes Vermeer. Their master works have been convincingly replicated using the camera obscura technique (but without concrete evidence from the artists themselves, we’ll leave that for art historians to debate). 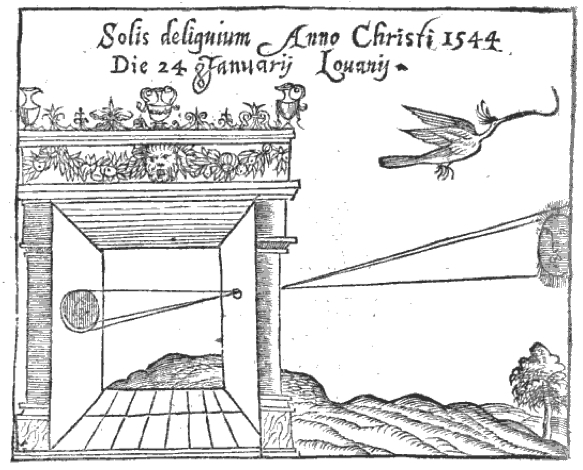 An early diagram of the camera obscura demonstrating how the optics worked. One thing I do appreciate about these early light pioneers, and with early photography in general, is their dedication to discovery and invention through experimentation. So, in that same spirit, I set out to make something original (or at the very least, something novel). I get a lot of my tinkering nature from my father, a modern day renaissance man. He was often in the garage building model airplanes, fixing broken electronics, inventing, and exploring new ideas, eager to share his creations with anyone who walked in. That last part is what sticks with me most: his need to share whatever he was doing. For this experiment, I am my father’s son. More than anything, this project is something best shared. From the beginning, TOKY’s camera obscura was a transformative effort. 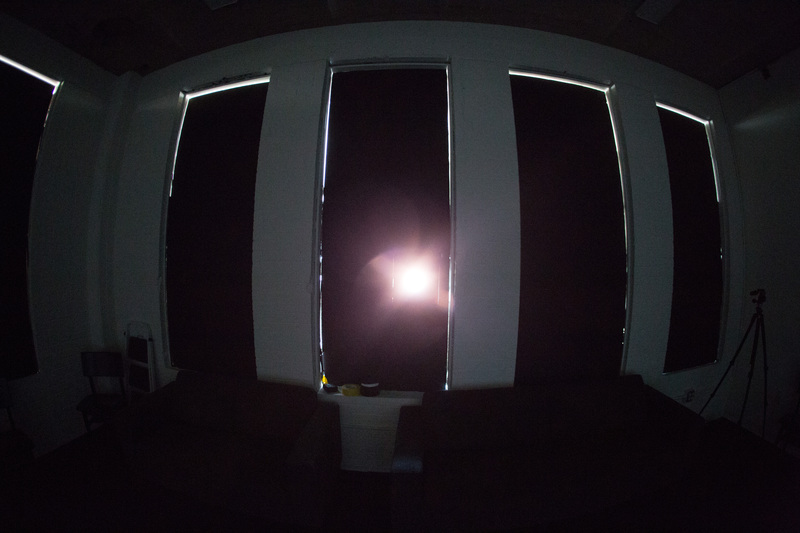 This is our “White Box” conference room sporting blackout curtains and near total darkness, the perfect conditions to create a walk-in camera obscura. If you’ve ever experienced a camera obscura, whether it was at an art show, or at someone’s house, you know how dark the room needs to be for it to work. Even then, the picture projected is still rather dark and slightly blurry. While still magical, it’s more of a parlor trick than something that would take your breath away. I wanted to use my knowledge of optics to improve the end result. I wanted an immersive and practical art installation. The first attempt at recreating a camera obscura provided a typical image — correct aspect ratios but lacking in clarity for the size of the projection. The first thing to tackle is the sharpness of the image. To tinker with the sharpness, you have to understand the basics of optics. Our eyes work in the same way as a camera obscura, point for point. We literally see the world upside down. (I know what you’re thinking, “But I see everything right side up!” Sort of, but no.) Our brains flip the incoming image and interpret it correctly, helping us see “right side up”. Taking a cue from this, and knowing that eyeglasses aid in bringing clarity to blurry vision, a lens would do the trick, I theorized. This also had the added benefit of creating a brighter image, since the opening would have to be larger to accommodate a lens. Converging lenses redirect light to a sharp focal point. A few calculations and confusing YouTube videos later (darn you, high school physics! ), I figured out that I needed a 4000mm lens. That is the distance from the focal plane (lens) to the film plane (wall). A lens of this focal length is rather uncommon, so I had to explore my options. I experimented with some weak reading glasses, but the focal length wasn’t quite right for a room this large. I found a large converging lens online and it seemed promising. I also built a rudimentary iris to change the aperture, if need be. On to my second attempt: reversing the image so that the output is oriented the way we expect to see it, right side up. Here is where the failures started mounting up. I built a crude three mirror system that bounced the light right-side-up again, but in doing so, the light was diffused so much that the image was nearly lost before it could be delivered. So much light is lost when it is reflected on mirrors (about 20-40% per mirror). While this worked in concept, a surreal upside down image was what we had. Before adding the custom lens and aperture. Dark, blurry images that were more creepy than impressive. The custom lens and aperture combination took the camera obscura results from blurry to stunning. After building in the custom lens kit. 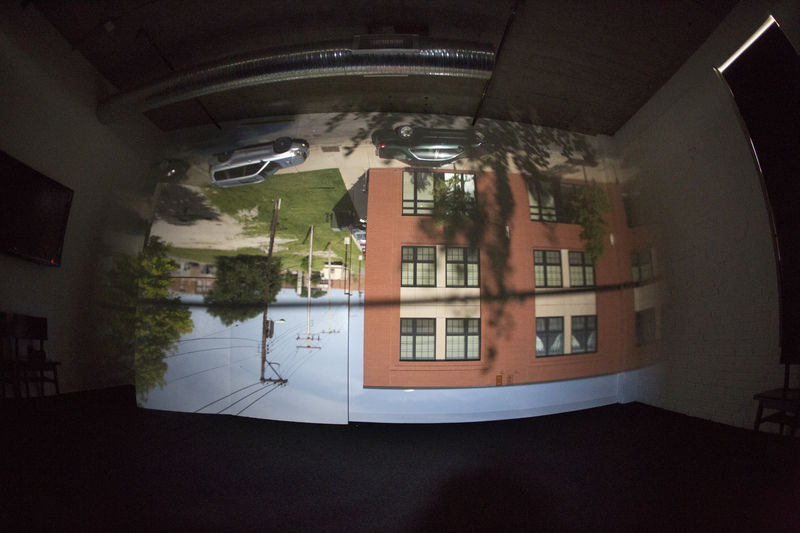 The resulting image was a spot-on, room-sized reproduction of the building and lot across the street, albeit upside down. From this point, the work directed itself. I had the idea of augmenting an existing concept and the practical applications guided me to the next step. “Alright, that didn’t work, what else can we try”, was my motto. Trial and error, like the optics tinkerers of old. The images produced by this home-made camera were incredible. With the size of the lens I used, I discovered that I had a pretty shallow depth of field. This meant I could focus on things close up, or far away, and everything else went out of focus. It was like being inside of a giant camera, changing the settings and focusing the lens from the inside. Of course, with my love of cameras, this was the most serendipitous surprise of them all. In the end, the camera obscura isn’t just about the image it produces, the wonder comes from the fact that an image even exists at all. You are seeing things exactly as they are, and yet somehow it doesn’t quite feel like reality. To me, one of the most fascinating things of photography is the idea of capturing a moment that will never be again. Here, we get to walk in, and see a “progressing photograph”, all of those fleeting moments in real-time. I think this might be what it was like for those who were around before cinema witnessing life through a lens. For more behind the scenes photos from the camera obscura creation process, be sure to keep an eye on the TOKY Facebook Page. We’ll be posting an album of images soon!